The Eartec HUB715MONAU UltraLITE 7-Person HUB Intercom System includes one HUB Mini Base Station, one UltraLITE Single Remote headset, five UltraLITE Double Remote headsets, one Monarch headset, seven LX600LI lithium batteries, an 8-port charger, and a large soft-side case. It is designed to accommodate seven-person crews who need to communicate wirelessly while simultaneously working with their hands. This system is designed to work in Australia. The Hub is designed to extend the range of your existing Eartec wireless system by over 1000', and moreover, to be portable; you can wear it on a belt, and thus allow your hotspot to travel with you, or place it in a single, changeable location. The UltraLITE single and dual headsets works in conjunction with the Hub for controlling the voice communication between users. They provide two-way voice communication and the microphone arm can swivel 270°. The lightweight Monarch headset features a slender backhand that offers a unisex fit, and is suitable for rough industrial environments. Note: Please note this product is intended for use in the Australia. It's not intended for use outside of Australia. The Australian version UltraLITE Single-Ear Remote Headset with Rechargeable Lithium Battery from Eartec is a self-contained, replacement full-duplex wireless intercom headset. It can be used to provide simultaneous talk and two-way voice communication for users that need to work with their hands, yet also require one ear free to listen to what is going on around them. 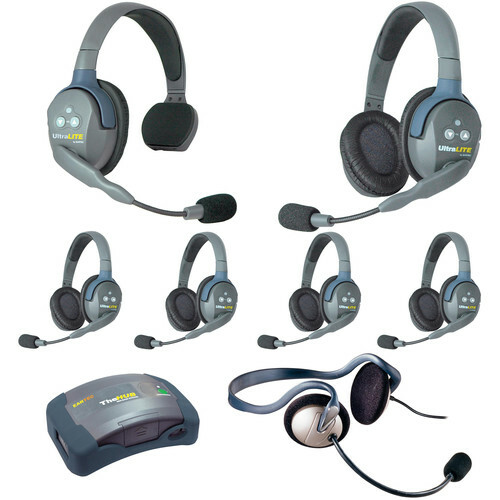 The Australian version UltraLITE Dual-Ear Remote Headset with Rechargeable Lithium Battery from Eartec is a self-contained, replacement full-duplex wireless intercom headset. It can be used to provide simultaneous talk and two-way voice communication for users that need to work with their hands, yet also require effective voice communication even in high-noise environments. If you require comfortable industrial headsets, look no further than the Monarch. These lightweight headsets were originally designed for use with commercial speech recognition computers. They are manufactured with PBT, the same material used to make automobile bumpers and are built for rough industrial environments. Monarch headsets feature a slender backhand that offers a unisex fit. The Eartec Multi-Port Charging Base with AU Plug Adapter features 8 bays to recharge the batteries for UltraLITE, UltraPAK, and HUB. When the batteries reach full charge, the corresponding LED turns from red to green indicating that the battery is charged up and ready to go. The use of external batteries allows users to keep their systems up and running with minimal down time. The charge time is approximately three hours. The charging base ships with an AC adapter and AU plug. Box Dimensions (LxWxH) 7.4 x 6.4 x 1.6"
Box Dimensions (LxWxH) 10.0 x 4.0 x 4.0"
Box Dimensions (LxWxH) 16.3 x 9.2 x 3.2"